New correct design head light adjusting hardware set for your bird. 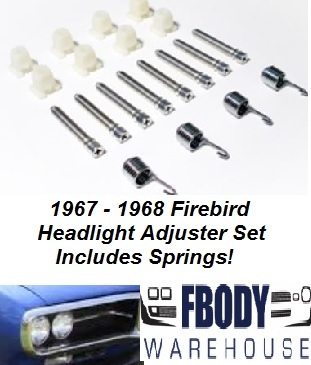 Exact fit for all 1967 - 1968 Firebird models. One kit does both left & right head lights. New correct design head light adjusting hardware set for your Firebird. Exact fit for all 1967 - 1968 models. One kit does full one car.